Just like in sports, winning in the Christian life takes coaching, endurance and focus. There are practical things you can do to strengthen and position yourself for victory. 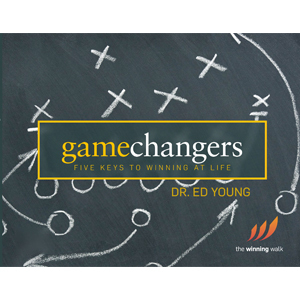 In Dr. Young’s new series, Game Changers: Five Keys to Winning at Life, you’ll learn how to surround yourself with the right motivators, keep your eyes on the prize, and stick to God’s game plan for success. The truth is, God’s new covenant is written on your heart. The truth is, Christ is there for you to lean on. The truth is, God can steady you and give you the balance you long for. The truth is, nothing you envision can compete with God’s goals for you. The truth is, God’s plans for you should be your goal. The truth is, you have a coach in Christ. The truth is, Christ can only use you as much as you’ll let Him. The truth is, a good coach pushes you to your best.